What do you know of…? 2.2 How does saffron taste like? When the plant blooms, long stigmas of very intense red color appear in the corolla of saffron flower. They are commonly known as saffron. 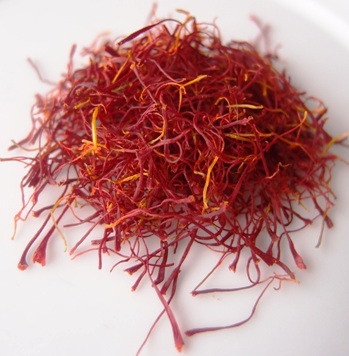 Saffron is used as a dye and as a spice to flavor dishes. Saffron sparingly stands in the kitchen mainly as a flavoring spice. Those who grow it, or those who can afford its price, also use it in herbal medicine as a natural remedy. The part that is used for cooking are the stigmas of saffron, known as saffron strands or saffron threads, often called “red gold” because of its high price. Dried stigmas of saffron, as sold as a spice. How to distinguish the real saffron? The authentic saffron can be distinguished because, when you add it to the water, it stains it slowly. This is one of the main features to distinguish it from the adulterated saffron, that often dyes water almost instantly. How does saffron taste like? Saffron adds a distinctive flavor to dishes, slightly sweet, slightly bitter and with metallic shades. It is yellow in color, deep red or brownish. – Pirocrocin: component responsible for the bitter taste of saffron. It has eupeptic and appetizing properties . – Crocin and crocetin: are natural deep red pigments responsible for coloring power of saffron. With choleretic effect, it is also antioxidant for cardiovascular health. 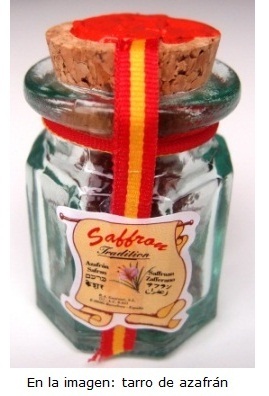 – Safranal: responsible for the aroma of saffron. This components has beneficial properties for eye health. The authentic saffron is gluten free, making it suitable for coeliacs. If crocuses are adulterated, they may contain gluten. Buy saffron strands instead of ground saffron to ensure the authenticity of this product. – Saffron is available in most local markets, larger supermarkets and food stores. We’ll find it along with the spices. – On the Internet you can also purchase this spice. In this case, we must look for online shops that provide us this product. – It is Not recommended to buy saffron which is not properly identified. The label should inform at least the content, quantity, quality, origin, producer and expiration. Like all spices, saffron has volatile components, which can be lost easily. To prevent degradation, it should be kept in a sealed glass jar in a cool, dry place, protected from light. Saffron can be preserved for 2 years. The whole saffron (threads) is retained longer than saffron powder, which loses its flavor in 11 or 12 months. … Previous reading: Saffron medicinal properties //Continue reading… Why is saffron so expensive?